Excel has designed an entirely new scooter based on years of experience and feedback from users. The scooter meets high standards in the field of medical suspension comfort, safety and durability. 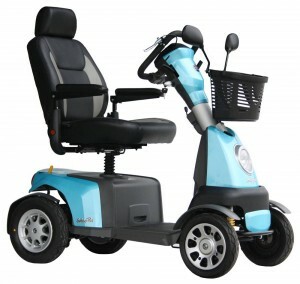 Excel Galaxy Plus 4 wheel comes standard with: angle adjustable steering wheel, step less adjustment option from the handlebar, a user friendly and intuitive dashboard buttons control, removable basket at the front anti-tip wheels at the back, headrest, independent and adjustable suspension on the front and rear wheels, impact resistant plastic covers, in four trendy colours and theft by means of a key. The four-wheel variant comes with batteries and charger. • Adjustable steering for maximum control. You can purchase the Excel Galaxy Plus 4 in four different colours.